Although community colleges are called by various names around the world, they all tend to serve as an alternative pathway that offers options for university overflow, adult learners, displaced workers, bright students from low-income families, and therefore, a “second chance” for nontraditional students to gain a basic education that accommodates the educational needs of the communities they serve (Raby and Valeau 2009). These institutions are increasingly called upon as “first responders” to retool displaced workers and meet regional medium-term labor requirements in high-demand occupations (Levin 2001). Increasingly, courses offered at these colleges represent the only avenue for postsecondary education for many students, especially from underprivileged backgrounds. Student enrollment underscores the crucial role of community colleges worldwide as 900,000 full-time and 1.5 million part-time students attend over 900 Canadian community colleges, and 44 percent of all US students attend over 1,177 community colleges (see Raby and Valeau 2009; Eisner, Boggs, and Irwin 2008 for cross-country comparisons). 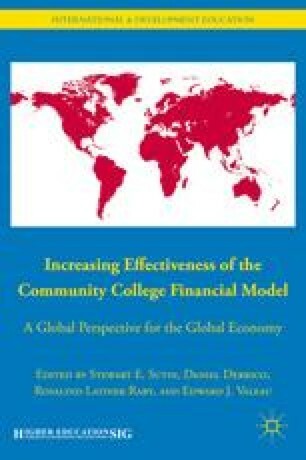 While its core multipurpose mission (Cohen 2009) has not changed appreciably in almost 50 years, economic and sociopolitical globalization has forced community colleges worldwide to reprioritize their central focus and expand their mission. American Association of Community Colleges (AACC). 2010. AACC Homepage. Washington, DC: AACC. Available online at: http://www.aacc.nche.edu.